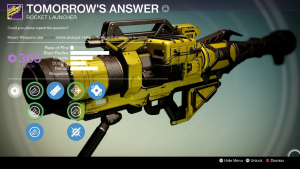 The Tomorrow’s Answer is a Trials of Osiris rocket launcher. 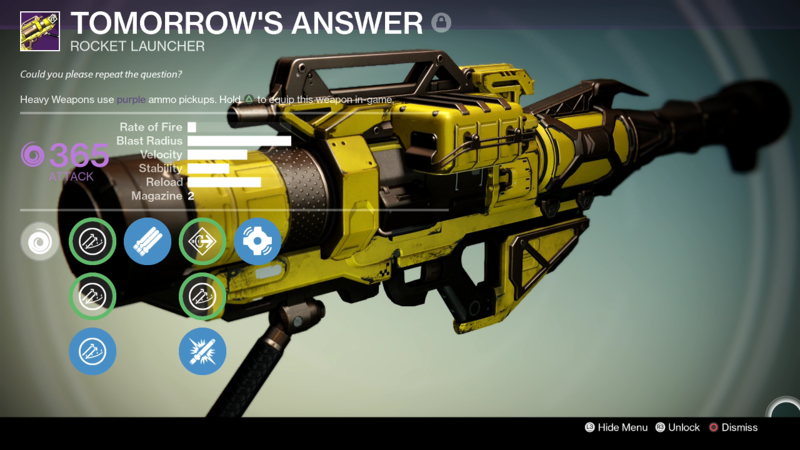 It falls in the high blast radius group of rocket launchers.. much like the Admonisher III, Radegast’s Fury, and the Ash Factory. You can get it from the Trials of Osiris, either buying it from Brother Vance if he is selling it or from the Lighthouse if you can go flawless. Since it is a Trials of Osiris Weapon we can’t reforge it at all… Lord Bungie has already decided the best perks for it… interesting how they picked tripod and grenades and horseshoes eh? Here are the Perks it comes with. Tripod – Launcher can hold 3 rounds in the tube (instead of 2). Even though the Tomorrow’s Answer comes stock perks that we can’t reroll, Bungie went and picked the best ones for PvP play for us. It’s rate of fire is… okay, I’m not sure why they went with tripod (the magazine already has 2 why waste a perk on just 1 round more? ), and velocity is so so. The middle perk tree though has some really good choices in case you want to change up your playstyle… but all in all I actually prefer my Admonisher III over the Tomorrow’s Answer. I can just go buy an Admonisher III and roll for the same perks and get twice the rate of fire. Without having to go flawless! So all in all I would say there are better choices than the Tomorrow’s Answer. Plus it looks like a Tonka Toy.